WOW!! I am so overwhelmed by all of the support and generosity that you have all shown to Nikki and I. When I had the idea for the sale, I was hoping that we would be able to raise enough money to pay half of Nikki's vet bill ($325 of the $750+), and that was my goal. The sale has been going since Saturday afternoon, only two and a half days now, and you have all helped me so much that I've actually exceeded that goal!!! I cannot tell you what it means to me that you've all reached out to me, and how wonderful it feels to know that I will be able to make a really good payment to the vet for Nikki's care. This has been acutely stressful, being so scared for her, and trying to find a way to make sure she was able to have the care she needed and still be able to meet the payments. As tight as things are financially, for everyone, it is even more touching to me that you would reach out for us the way you have. Nikki is doing really well! She's been playing with her favorite frog toy, barking cheerfully, and gone back to being able to chew her food and her dental chewy sticks. She has another vet appointment later on this week, to check out her extraction sites and make sure she's healing well, but from all indications, she's well on her way to being her old self. I'm going to leave the sale going until Thursday evening, so if you would like something for 50% off, you'll still have an opportunity to snag something. Just convo me on Etsy or write me a note in Facebook, and I will change the price of the piece for you. THANK YOU so very much, both to those who purchased something, and to those who shared my blog link and showed their concern in many ways. Love you guys, ya know? I've been absent for quite awhile this time, no blogging for over a month. Time to get on here and say something! It's amazing to me what happens when you start something with zero expectations. 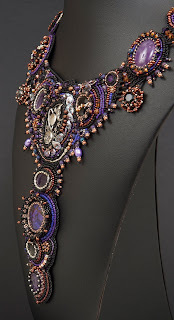 I began this whole necklace as a play time... no thought of where it might go, just sitting and playing with beads. 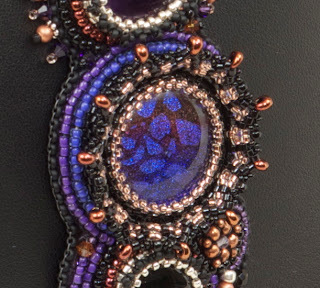 I started with Linda Roberts' gorgeous dichroic cab, and decided I would double bezel it, and see how it went and what I could add to the peyote. It ended up very dimensional, and I loved it. 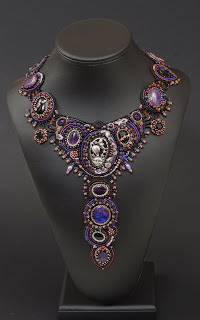 (To double bezel, I peyote around my cab as I normally would, and then start another line of peyote directly next to the cab, and bezel around the bezel, where I can then decide if I'd like to bring it in and snug it up to the first one, or bring it out with a flair, which is what I decided to do here.) I'm really enjoying doing the double bezels, as there are so many effects you can come up with when you have that extra dimensional piece. The whole process started to be about layers. 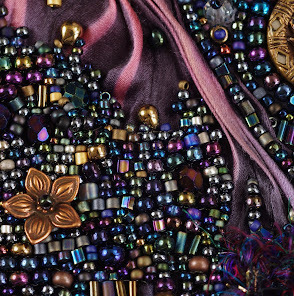 Almost every cab has parts beaded into it that stand out and up from the work, very spiky and organic. 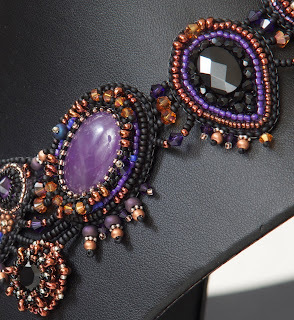 The fringe (which I don't really think of as fringe, it's more like tiny spikes) is made up of size 6 beads, bali silver discs, and copper beads. There is a ton of metal in this piece, even though it doesn't show up in your face; most of the sterling and copper are hidden here and there throughout. 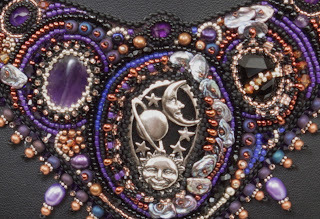 I've layered pearls and metals over backstitched beading, and put something on top of something else to see what happened. After finishing Linda's cab, I just started adding things where ever they seemed to fit. It just grew and grew. The silver 'cab' that is the main focal was a pendant, and I clipped the ring off of the top and bezeled around it after mounting it on ultra suede. 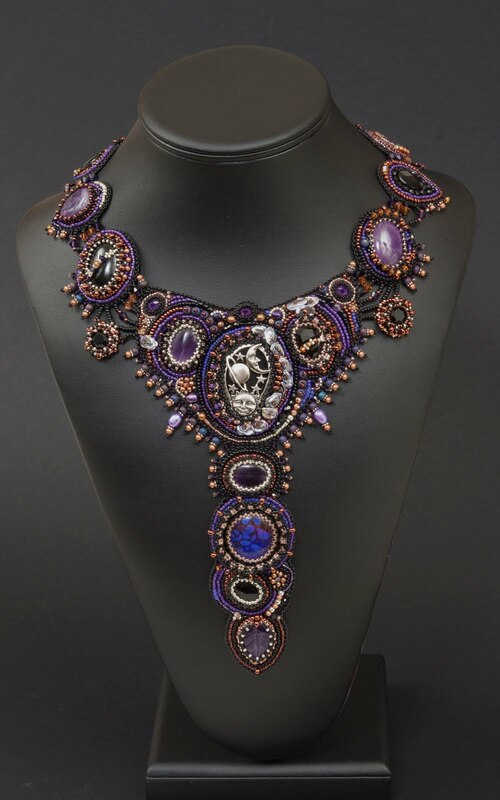 There are amethyst cabs, beads and carved leaves and onyx beads and cabs as well. I used some Swarovski chatons in the front as well, and spiked them out. 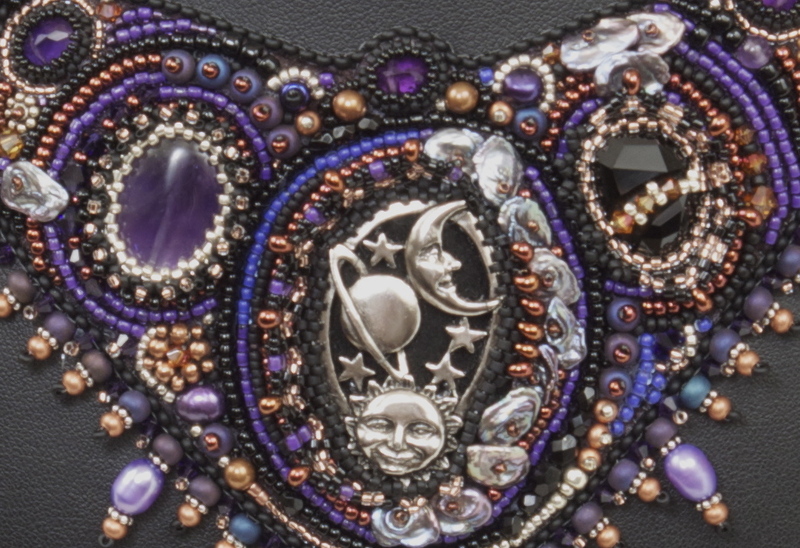 Every bezel and bit of beadwork is different than every other one on the piece, mainly because I was playing, and then because I really liked how it looked. I'm still not sure if I'm happy with the back, where the netting finishes the ends and leads to the clasp. (That copper toggle was fabricated by Hodgepodgerie on Etsy, in case any of you are looking for some lovely handmade clasps. She's wonderful to work with and very quick with your order.) I like the netting, I'm just not so sure it fit with everything else, despite the spiky fringe on it. After a whole day's worth of fiddling, I did decide to let it lay and leave it be. On a more personal note, I didn't intend to name this 'galaxy' at all. During the work process, I had a very bad bout with my depression, and I fully intended to name it after how I was feeling at the time; Inner Darkness. I felt like I was trying to portray how I felt despite the play with the beads, but it just sounded so damn pretentious. And then, when I posted a teaser photo on FB, one of my friends commented that it was like looking into the universe. That made me grab onto Galaxy, and I felt much better sending it out without the depression attached to it. I haven't put it up for sale as of now, as I am having a very hard time with pricing it. It's hard, I think, to price things that were cathartic to you, and that feel personal on such a level. On the other hand, it's very unlikely that I would wear it myself, so.... I also have two more new pieces that will be photographed very soon, and I'm looking forward to sharing. One of them is my latest ColorPlay necklace - this time in Golden Olive. Yum!! In other news, the Mavens have come back from our vacation/hiatus, but we are sad that Christina of Good Quill Hunting has decided to concentrate on her solo business and has left the group. I do the website and so on, and I am going to be taking down her incredible gallery of work, which is personally sad to me. I hope you will all continue to follow her on her journey; make sure to keep checking her website, her Facebook page, and her blog! We wish her the very best of luck. We have also been toying with a new idea for the blog, and I am hoping we can start this next Tuesday, so make sure to check that out, too.